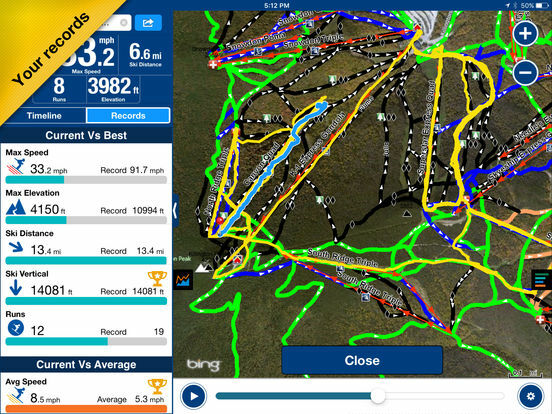 The most comprehensive app for ski and snowboard! 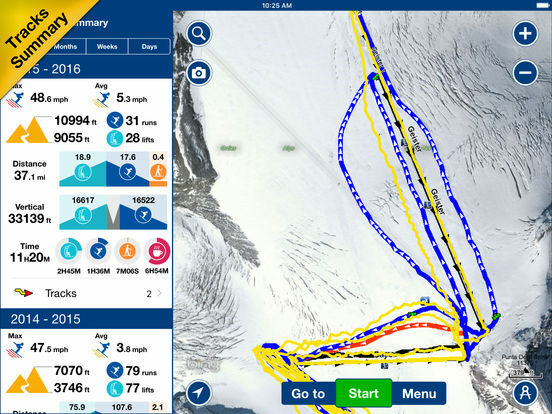 Navionics Ski app includes maps of over 2,000 resorts worldwide! Get 37,000 km (23,000 miles) of trails in US, Canada, Europe, South America, Australia & Asia in one app! With awesome features to record tracks, view stats, get route guidance, view and playback your ski runs, check snow and weather conditions. RESORT MAPS – We offer the largest amount of resorts found on iTunes App Store! Once maps are downloaded, no further internet connection needed thereafter. Interactive resort maps identify trails and lifts and allow you to locate ticket offices, lodges, rental shops and more! Even edit the map to share local information that all users can enjoy. View resort maps with Satellite overlay! 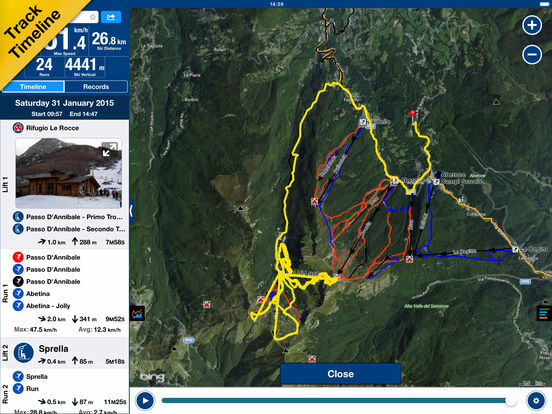 TRACKING - Track your runs, view statistics that include time and distance spent skiing downhill, on lifts and on flat. Also get visibility on the amount of time you stopped. See current speed, as well as max, last, and average downhill speed (including any stop time), as well as average speed in motion (excluding any stop time). Check your individual run stats, displayed in a cool user-friendly layout, against your personal bests then try to beat your own records. Sort tracks by date, distance, speed or time. View the Timeline of each track to see run and lift details, photos taken while tracking and POIs where you stopped, all accessible from your tracking module. Customize your console to suit your needs and enjoy the dynamic playback with optional Satellite or Terrain overlay. Note, tracks are still recording and saving should you receive a call or when battery runs low. No data or phone signal needed to record your tracks. Customize your console to suit your needs and enjoy the dynamic playback with optional Satellite or Terrain overlay. ROUTING - Tap “Go to” on the main screen where the route feature will help you navigate to a new trail you haven’t tried before with choice of easy, medium or difficult runs and distance. No other ski app offers you instructions on how to get to a new lift or trail! WEATHER – Get weather forecasts directly in the app! See a comprehensive display of weather that includes: daily and weekly predictions, 3 day wind forecasts, sunrise/set, moon phase and snow reports that include top and base accumulation, number of open lifts and trails. Save your favorites! SHARE – Facebook, Twitter, or Email your tracks, photos, or markers! Emailed .kmz files can even be viewed in Google Earth. 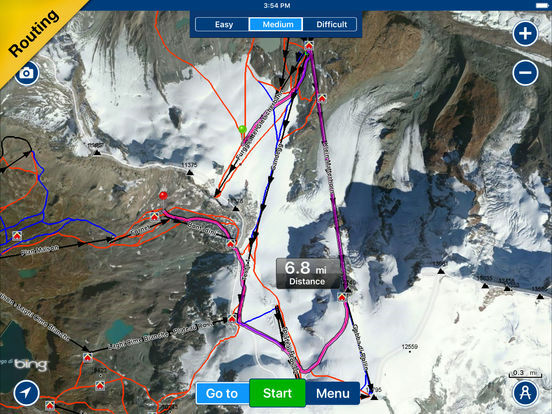 Navionics ski apps contain detailed maps of the most popular ski resorts in the world. Find resort maps in the USA for: Alyeska, Whitefish, Sugar Bowl, Mt. Bachelor, Taos, Park City, Aspen, Vail, Killington, Mount Snow, Sugarloaf, Squaw Valley, Steamboat, Jackson Hole, Snowbird, Alta, Mammoth Mountain, Grand Targhee, Solitude, and Telluride. In Canada: Lake Louise, Banff, Hidden Valley, Fernie Alpine, Mount Baldy, Whistler Blackcomb, Red Mountain, Big White, Kicking Horse, Sun Peaks, Le Massif, Tremblant. In Europe: Chamonix Mont Blanc, Tignes, Zermatt, Kitzbuhel, Hintertuxer Gletscher, Zermatt, Cortina d’Ampezzo, Mürren, La Rosiere, Bonneval Sur Arc, Glencoe and so many more! 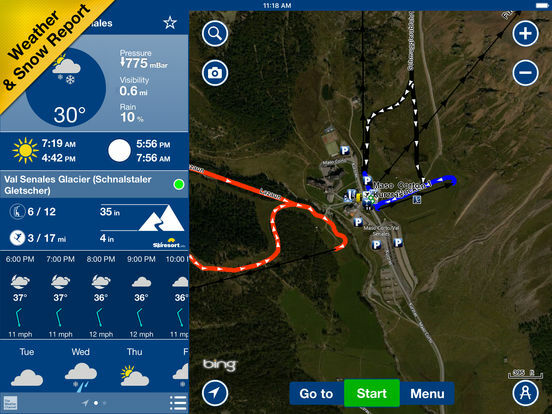 The Navionics Ski App is compatible with iPhone and iPad. To extend the enjoyment of your day, you can automatically sync your Tracks, Photos and Markers across the devices. Track on iPhone by day, playback on iPad at night! How cool is that! Note: Continued use of GPS running in the background can dramatically decrease battery life. TIP: turn "cellular data" OFF to save battery life. - Markers pinpointing your favorites are now increased to 1,000! - Tap Menu > Inbox for stored messages from us about tips, events, updates and more. - Photos accessible from Timeline and from the map are now shown in an improved layout. It is also possible to add comments in the Timeline.